Successfully Added Streetlife - Portable GPS Navigator for Motorcycles to your Shopping Cart. Finally, a Portable GPS Navigator for Motorcycles! The easy-install, perfect fit RAM-mount of this device fits almost any motor bike to send you on your way with accurate, real-time, turn-by-turn GPS navigation. No more looking up directions, printing maps and then trying to follow them with your fingers while riding. Experience amazing real-time GPS guidance that will notify you of every street and intersection and lead you to your destination, turn by turn. This Portable GPS Navigator's high-tech processor and powerful GPS chip will keep up with your speed to let you know exactly where you are, even at 300 MPH. Popular motorcycle GPS devices all come with a high markup price due to their brand name, but we bring you the Streetlife Portable GPS Navigator for Motorcycles at an amazingly low, factory-direct price. Let's do a little comparison. This amazing Portable GPS Navigator for Motorcycles includes everything you need to install it on your bike and get started. Available in our warehouse now and brought to you at our usual low factory-direct wholesale price, order now and we will express ship it tomorrow, guaranteed! 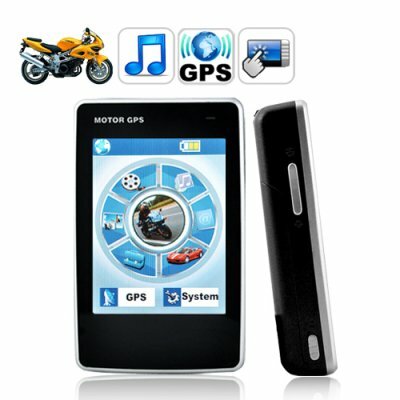 Brought to you by the leader in wholesale electronics and GPS gadgets - Chinavasion. The unit includes an evaluation GPS software - we recommend purchasing a GPS software package from your home country that best covers your region of the world..
Can I use this Portable GPS Navigator in my car? Of course! Take it with you when you go visit your friends out of town! Is CPU and RAM really important? Definitely, the higher power your GPS navigator is, the easier you get to your destination. Imagine a slow GPS navigator that lags behind by a few seconds - you could miss a turn and end up wasting so much precious time! Will this GPS navigator fit on my motorcycle? The included RAM Mounting kit can be adjusted to fit most all motorcycle handles and bars.